"When Pampers approached me to collaborate on the new Pampers Pure Collection, I jumped at the chance to work with a brand that I love. I wore Pampers… John wore Pampers…. we are a Pampers family!" CINCINNATI--(BUSINESS WIRE)--Chrissy Teigen has joined the Pampers family as the first-ever Creative Consultant for the new Pampers Pure Collection. 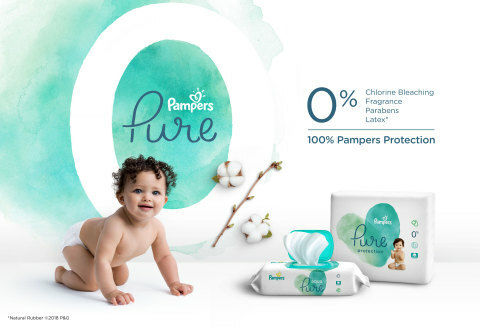 Made with premium cotton and other thoughtfully selected materials, stylish prints and 100% Pampers protection, the Pampers Pure Collection is a new choice for parents searching for diaper and wipe options in the “natural” category who don’t want to sacrifice performance. In this first-of-its-kind creative-led partnership for Pampers, Chrissy will provide her mom expertise and fashion know-how over the next two years, collaborating with designers, R&D and marketing on all things Pampers Pure, like the adorable diaper prints. To kick-off her partnership, Chrissy and Pampers are acknowledging the shared passion that parents have to give their babies what they believe is best. In a brand new video released today, Chrissy and other moms share their heartwarming stories of unconditional love and no compromise. Pampers Aqua Pure wipes are designed to give parents Pampers highest water content wipe while still delivering outstanding skin protection. The wipes are crafted with carefully-selected ingredients including 99% pure water and a touch of premium cotton, making them safe and soft even on delicate newborn faces, hands and bottoms.